We’re all used to the tirade of book-to-screen adaptations by now. Just in the last year we’ve seen Margaret Atwood’s The Handmaid’s Tale adapted into a wildly popular TV series, and this year promises us adaptations of Madeleine L’Engle’s A Wrinkle in Time, Sylvia Plath’s The Bell Jar, Ray Bradbury’s Fahrenheit 451, Luisa May Alcott’s Little Women, and so many more. So it comes as no surprise that some of our favorite works in translation are similarly finding their way to the screen. Here’s the latest on a few of these forthcoming adaptations. Antonio Di Benedetto‘s 1956 Argentine classic, Zama, was published in English by NYRB in 2016, and Esther Allen won ALTA’s 2017 National Translation Award for her translation of the novel. 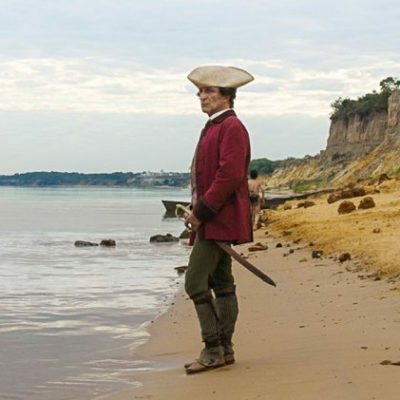 Argentine director Lucrecia Martel has adapted the novel for the screen, with Pedro Almodóvar and Gael García Bernal among those who have signed on to co-produce it. Watch the trailer and read this glowing review. The film debuts in the US in May of this year, and we can’t wait! You probably remember last year’s talk of a TV adaptation of Elena Ferrante’s Neapolitan series, beginning with an eight-episode rendering of My Brilliant Friend. It seems that, while the show will be filmed in Italy with Italian actors, HBO will air the series here in the US. And Ferrante (who was just hired to write a weekly column for the Guardian‘s Weekend magazine) is apparently helping to write the screenplay. Casting began last year and the show is currently in production.